A cobalt blue sky with just a whisper of white clouds on the horizon. The soft rustle of palm trees fluttering in the breeze. White sand, sparkling like sugar in the sunlight. In the distance, the glistening waters of the Caribbean in shades of luminous turquoise and emerald green. Now imagine that this incredible location, just a 25-minute flight from South Florida, is the setting for your island vacation home. 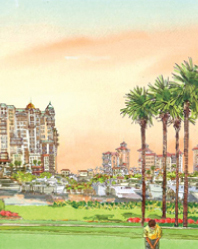 Ginn sur Mer is a palatial, master-planned development. It will take 10 years to build. Spanning 2,000 acres on Grand Bahama Island, this tropical haven will soon become the ultimate vacation destination. 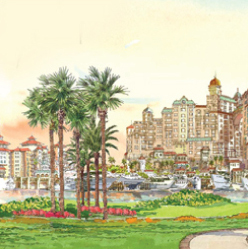 Ginn Clubs & Resorts, a world-class developer, has spent years cultivating ideas for Ginn sur Mer. Now, with the blessing of the Bahamian government, it has been granted permission to make this $4.9 billion dream a reality. 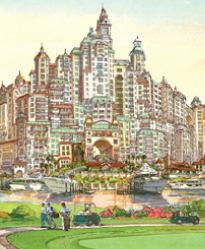 For the privileged few, there will also be a chance to own a vacation home in this tropical paradise. 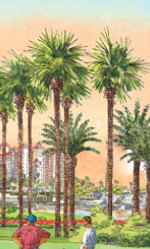 Available at pre-construction prices are 1,400 homesites, many of them oceanfront or overlooking a golf course, and 4,400 condo hotel suites. Today, you have an opportunity to share the Ginn sur Mer dream and lifestyle. To learn more, contact us today for details or request our FREE 17-page Ginn sur Mer report.